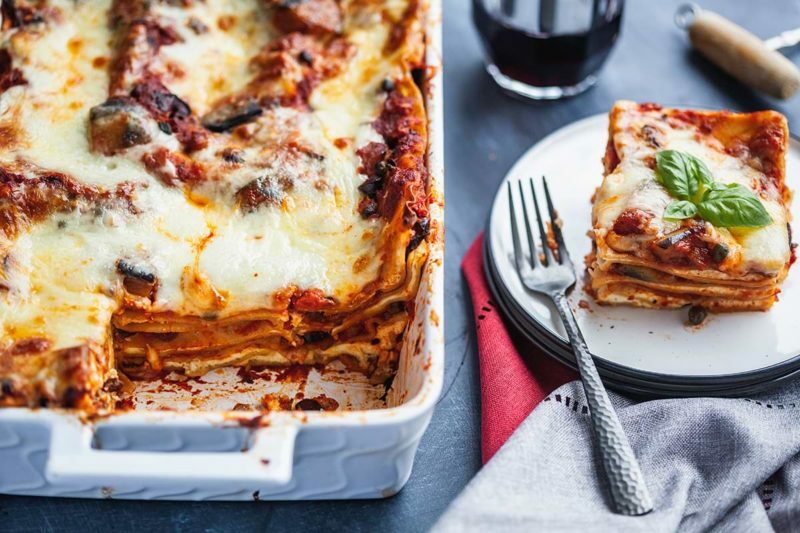 Everyone loves a good lasagna. And this one doesn’t disappoint! The combination of anchovies, olives and capers gives this Napoletana sauce a robust and a slightly briny Unami flavour that is sure to please. Trim the stems from the eggplants. Remove strips of peel about 1 inch wide from eggplants, leaving about half the peel intact. Cut eggplant into 1-inch cubes, and toss in a large bowl with the salt. Place into a colander, and let drain for approximately 1 hour. Rinse the eggplant under cool running water, drain thoroughly, and pat dry. Preheat the oven to 425°F (218°C). Lightly grease a ceramic baking dish with olive oil. In a large pot of salted boiling water, cook the lasagne noodles until they just start to soften, 4 to 5 minutes. Do not over boil. Drain and transfer to a baking sheet and toss with a drizzle of olive oil to help keep them separated. In a large saucepan, heat 2/5 of the olive oil. Add onion and cook over moderate heat until golden, 5 minutes. Add eggplant and remaining 3/5 of olive oil; season with salt and pepper. Cook, stirring, for 3 minutes until the edges start to get golden. Add garlic, anchovies and crushed red pepper flakes and cook over moderate heat for 1 minute. Add the tomato paste, stirring for 1 minute. Stir in the olives, capers and crushed tomatoes. Bring to a simmer and cook until the sauce is thickened, about 12 to 15 minutes. Stir the oregano, basil, and parsley into the sauce. Season to taste with salt and pepper, bearing in mind that many of the ingredients are salty. Meanwhile, in a medium size bowl, stir the ricotta with the eggs and season with salt and pepper and set aside. Spread 1/4 of the puttanesca sauce in the baking dish. Top with 1/6 lasagne noodles and spread with 1/3 of the ricotta. Top with another layer of noodles followed by another 1/4 of sauce. Repeat layers with remaining ingredients. Top with remaining sauce on the upper most layer. Uncover and bake for 10 minutes. Arrange the mozzarella slices over the top and bake for 10 minutes longer, until most of the liquid has been absorbed and cheese is golden and bubbling. Let stand for 15 minutes before serving. Serve garnished with chopped parsley.